THE HUEY CREW ATTENDS A GARDEN PARY WITH A DIFFERENCE! 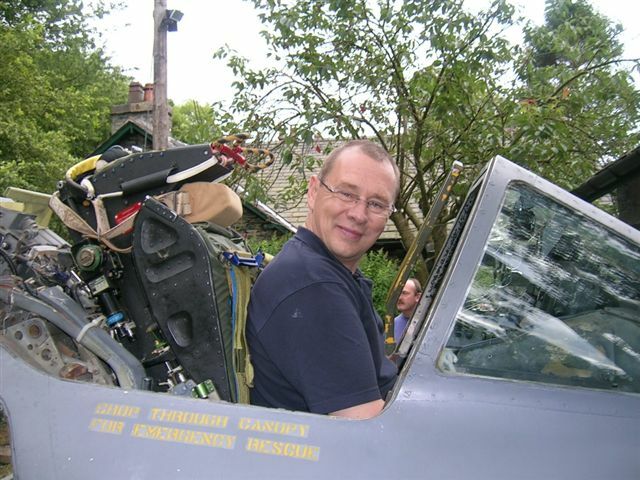 Neil’s other passion is English Electric Lightning aircraft. He collects anything and everything to do with this historic machine! His long standing passion for these aircraft goes back to his childhood days. 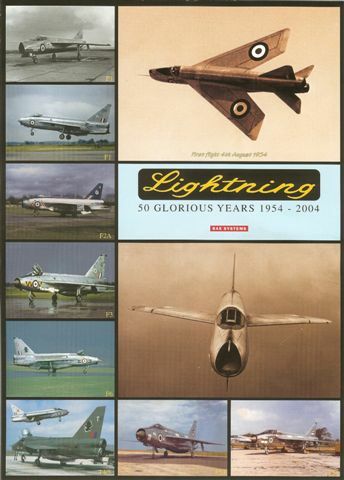 Over the years he has accumulated a lot of Lightning memorabilia and last year he found and bought a Lightning F6 cockpit from aircraft number XS922. He keeps the cockpit at home, Spark Bridge in Cumbria and has attended a few “Cockpit Days”. Neil then heard about XM172. 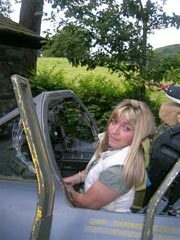 She was due to be scraped but Neil stepped in to save her from the scrap man! 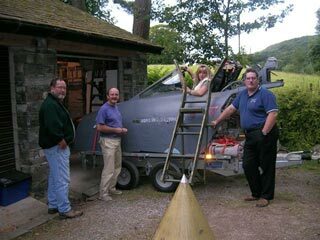 He bought her from Wycombe Airpark, Booker and transported her by road to temporary storage at Greenodd in the Lake District. After planning permission was granted “172” was moved again. She now resides in his back garden at Spark Bridge in Cumbria. His aim is to restore and preserve XM172 to museum standard for future generations to enjoy. 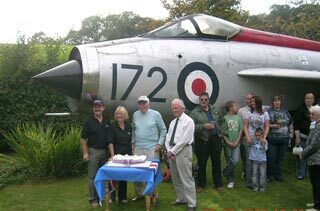 Neil very kindly invited the huey crew, together with all the inhabitants of Spark Bridge Village and members of the Lightning Heritage Group to a garden party to celebrate the safe “landing” of “172”! What a sight! We’ve never been to a garden party like that before with a full-size plane nestled in amongst the borders and vegetable patch! We all had a fantastic day-thanks Neil and Heather! Congratulations on fulfilling your dream. 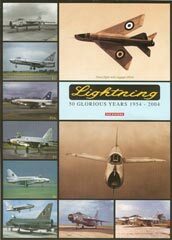 XM172 was built by English Electric at Samlesbury, Lancashire and made her first flight on 10th October 1960 when it was delivered to the company’s test airfield at Warton, Preston, flown by J.K. Isherwood. The F 1A was essentially much the same as the F1 but with the inclusion of a UHF radio, external wiring tunnels and a removable in-flight refueling probe. No56 Squadron at RAF Wattisham was designated as the first unit to receive this particular mark and XM172 was in fact the first aircraft delivered to them on 14 December 1960. Whilst with 56 Squadron it was first coded “P” and when, in April 1963, the squadron passed some of their aircraft to No 226 OCU at RAF Coltishall, XM172 was recorded “B”. In the 1960s 56 Sqn flew an aerobatic team called “The Firebirds”; XM172 was one of the aircraft allocated for this display and was seen at many air shows during this period. 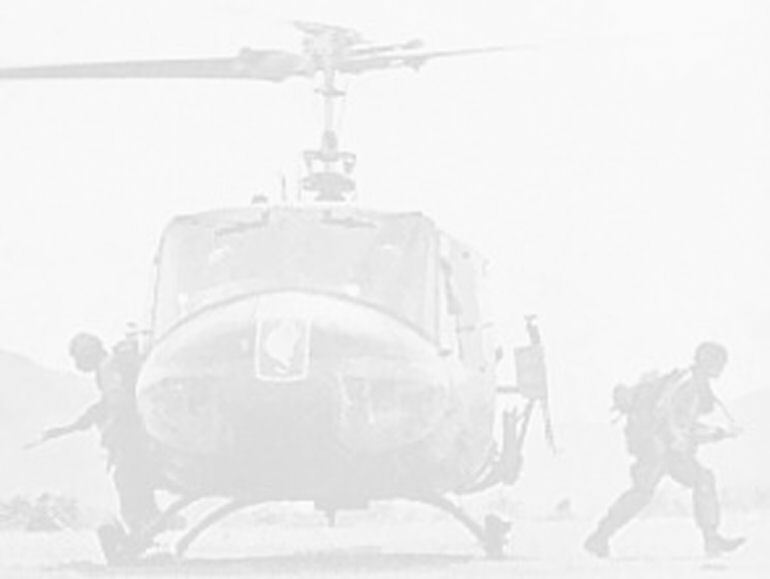 In February 1965 the aircraft was transferred to RAF Coltishall to join No 226 OCU. 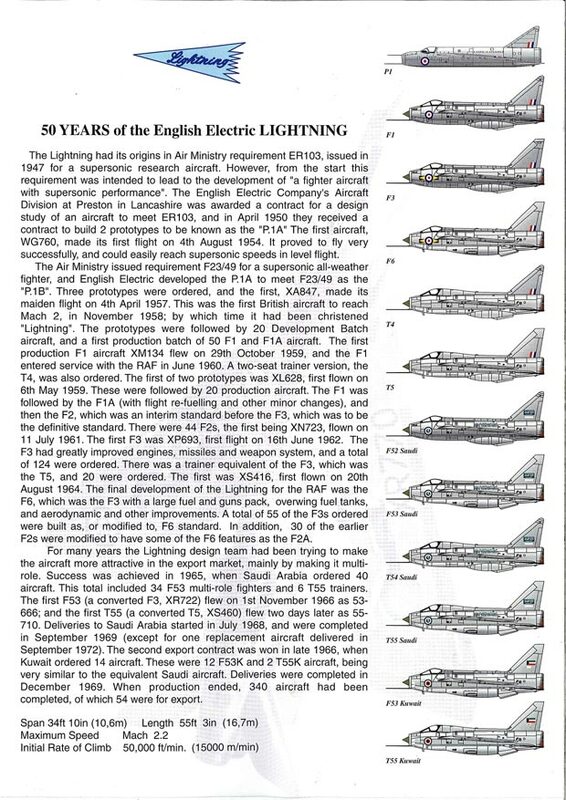 This particular unit was divided into two shadow squadrons, No 65 and No 145 and was the major training unit to convert pilots onto the Lightning. In its time with No 226 OCU, XM172 flew with both these squadrons. As was standard on 226 OCU aircraft, it was coded with the three numbers of its serial displayed on the nose in large black letters. On 11 August 1965 XM172 went to No 60 MU at RAF Leconfield for a major servicing; returning to Coltishall in September 1966, on this occasion joining No 145 Sqn. 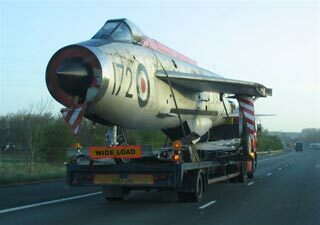 It remained at Coltishall until 15 October 1973 when again it returned to Leconfield, but this time for disposal. 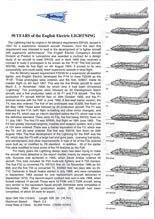 The last flight of XM172 was June 1974. Saved from the scrap man’s torch in 1974 it returned once again to Coltishall, this time to become a static display aircraft. After preparation for display, which required the aircraft to be considerably lightened, XM172 was placed on display on 24 September 1974 in a dramatic flying attitude in the marking of 145 Sqn. As with all display aircraft XM172 was issued with a maintenance serial number and, although not displayed on the aircraft, it became 8472M. In April and May 1981 it underwent a total repaint having the 145 Sqn markings removed, these being replaced by those of No 226 OCU. The aircraft’s first civilian owner was Wensley Haydon Baillie who requested that it remained as a gate guard at RAF Coltishall, which it did until November 1999. 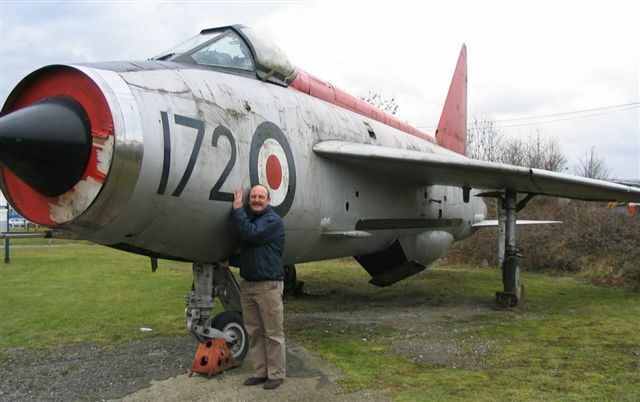 It was then bought by Barry Parkhouse and placed on display at Wycombe Airpark, Booker, until being sold to RotAirey Aviation (Neil Airey), Spark Bridge, Cumbria. XM172 was moved by road from Booker to a temporary storage yard at Greenodd on 27 April 2006 and subsequently moved the short journey to Low Lodge, Spark Bridge on 14th August 2006 where she now resides.